← A catch up blog- We have lost track of each other. We are now cruising down the Saone and nearly at the end of our boat travels for this year. This journey has been both a great adventure and a time of personal awareness. We keep having good coincidences, as if we are being somehow nudged, in a certain direction. 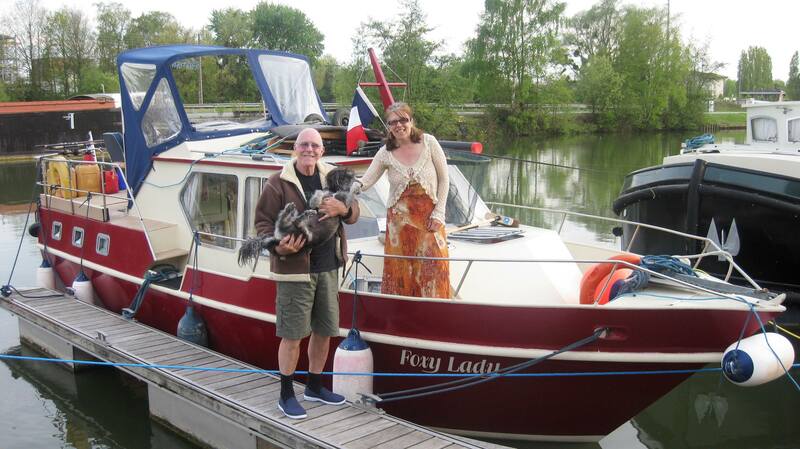 Within weeks of arriving in France, one of the first boating couples we met were Rog and Caroline in Chauny on Foxy Lady. They came on board and we had a great chat. They gave us good advice and information about boating in France as they had done if for many years. When they were leaving, Rog said he has a spare map for the Saone River and he would give it to me. I politely thanked him and took the map and thought to myself “I won’t need this as I won’t be going anywhere near the Saone”! But now I am on the Saone on the way to Chalon and very thankful of the map! Nuala loves it as it in very clear and easy to follow. This has happened to us many times over the journey and I am getting a lot better at listening to people and thinking when I am talking to them as to what message or information they have for me and how can I help them on their journey. 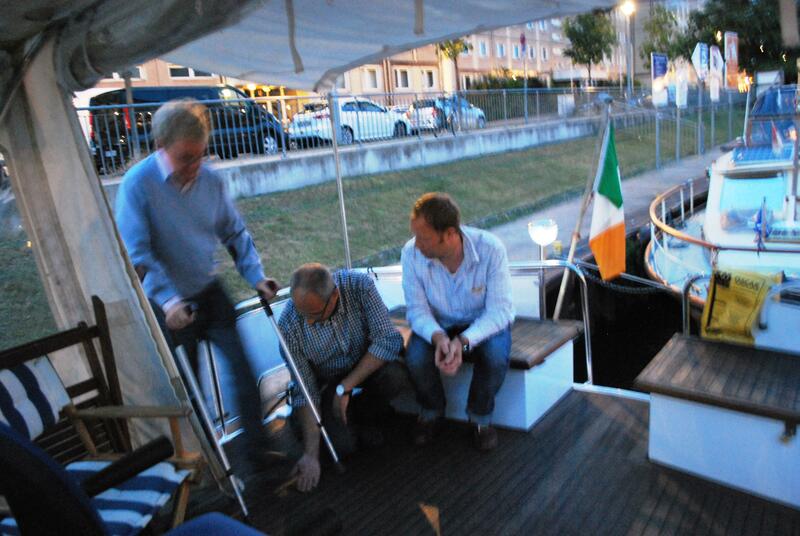 The two men who Nuala invited on to the boat one night in Berlin. They turned out to be orthopaedic consultants in Berlin for a conference. They gave me the right advice to help fix my knee. Meeting Franz and Angelika on Herminie ll in Paris who advised us to go and stay in Zeuthen See when in Berlin (which was wonderful place to stay and a very safe place to leave the boat for the two weeks when we went back to Ireland). We would have never gone so far into former East Germany, if they had not told us to do so. 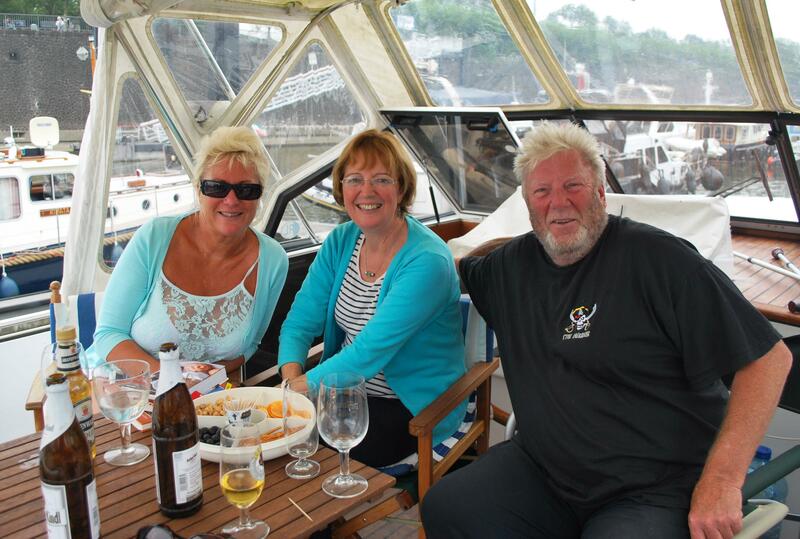 Meeting Peter and Denni on Cracklin’ Rosie, in Dusseldorf, who told us how nice Chalon sur Saone is, when we were searching for a winter mooring. There are many more stories and casual meetings that changed the course of this Gap Year. So why did we meet all these people? Why when something happened, that we thought was a problem actually turned out to the right thing for us to do and made the Gap Year so much better? Certainly one of the things I have learned this year is to be more trusting of the process of life and to slow down, give people my full attention when I meet them and listen carefully to what they are telling me. People who know me well will know that’s a big change for me!! This entry was posted in Adrian injury, Experiences on the Canals, front page, On the Journey, People We have Meet on the Gap Year, People who have helped us on our way, Places visited, Reflections on Life and tagged Berlin, Chalon, Chalon sur Saone, Craclin'Rosie, Dusseldorf, Foxy Lady, Herminie ll, paris, Saone, Zeuthen. Bookmark the permalink. Hi Adrian, there are some interesting thoughts and comments in this and recent blogs. However it would be interesting to know what you are doing, where you are and whats interesting. Tell us a story. Make us jealous. Hi Adrian, the whole journey, your comments on places you’ve been to and people you have met, and their influence on your journey have been fascinating to follow, and I must admit to twinges of jealousy myself occasionally as you’ve cruised your way along. Bill is a hard taskmaster!! Having said that, we don’t hear that much from Nuala!! Welcome in your winter mooring (hivernage!!!!!) at Chalon!!! Guess what, us too arrived at our “hivernage” today, a bit further South though in Toulouse!! I hope you like Chalon, bon, a LIDL a Leaderprice and a Carrefour in walking distance as well as downtown. And on the way to downtown you have to go along the “route des restos” ( restaurant street) on the island. Not bad at all!! Sorry I didn’t answer your email concerning the blog. My usual laptop broke (not physically but…..) and on this one I have no email addresses saved yet. Could you please send me a short email to alanandbeate@free.fr so I can store your email again! Thanks! We have done the Saone quite a few times over the years and love it. Really good choice! Especially as you will have a car to explore.